JOE STEELE Review | Warped Factor - Words in the Key of Geek. Matthew Kresal chose an appropriate time to finally read Joe Steele. The alternate history genre can be a fascinating one at times. It allows us glimpses into how history and our world could have been very different under just the slightest change of circumstances. 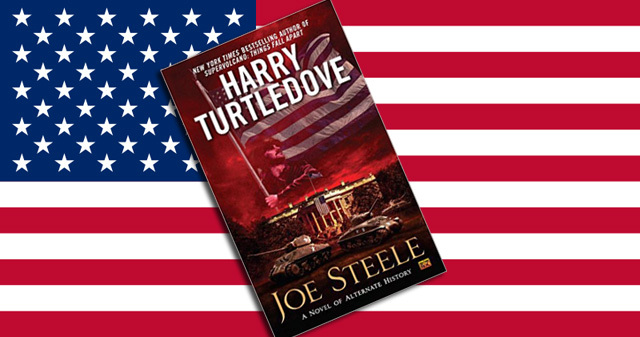 Harry Turtledove has been acknowledged as the master of this genre and his 2015 offering Joe Steele caught my eye ahead of its release. Some eighteen months or so after its arrival, I have finally found the time to read it and the result was an interesting "what if?" to say the least. The basic premise of Joe Steele is simple enough to grasp. Imagine that the parents of Joseph Stalin had come to the U.S before he was born, thus allowing him a rise to power not during the rise of communism in Russia but here during the Great Depression. It's a rise that, as the opening chapter of the novel presents, takes him right into the Oval Office. If you can accept the overall premise than you are in for a ride as Turtledove takes the reader on a tour through an America under Stalin (or should I say Steele?) that takes in two decades and enough real history to create a compelling narrative. To do so, Turtledove centers the narrative not on Steele but on two men caught up in events. They are the Sullivan brothers, Charlie and Mike, who start off in 1932 as journalists before their paths wildly diverge as a result of Steele becoming President. One ends up working in the Steele White House, while the other ends up on the wrong side of the man. Both Sullivans are interesting figures, men who find themselves caught up in extraordinary situations and come out in very different ways. Yet their reactions are quite believable and they help to make the events all the more plausible. In fact, there's a strong sense of credibility to the events of the novel throughout. Looking at what happened with the rise of totalitarianism in Europe during the same period, it's always amazed me that something like that didn't happen here in the U.S. Turtledove shows how circumstances might have allowed someone like Steele to not only rise to power but conduct the business of government in the way the novel presents. These include a "four year plan", work camps, the removal of many in opposition to him, and how both the Second World War and an equivalent conflict to the Korean War play out. If anything, I'm surprised that Turtledove didn't go further at times, such as including the supposed 1934 plot to overthrow FDR (a compelling story whose truth has been largely obscured by the mists of time). What happens at the novel's end also feels nicely credible as well, suggesting that once things go wrong they can never be set back on course again. All of which makes for compelling reading to be sure. Though the novel is not a perfect one. Despite how credible much of the events are (especially regarding the U.S domestic front) some of the portrayal of the international scene is less convincing, especially with the Soviet Union. One doubts events would have played out quite the way they do here if who Turtledove has leading the Soviet Union had indeed been leading it. Not only that but the overall credibility is admittedly stretched a bit by the fact that it is not only Stalin but apparently a number of his cronies as well all seemed to have been born in the U.S at around the same time. It's something that does undermine the novel somewhat, but if you can accept the overall basic premise that that is not likely to be much of an issue. There is also an issue of pacing. Despite the fact that this is effectively an expansion of an earlier short story (inspired by a line in Janis Ian's song God and the FBI, about how "Stalin was a Democrat") the novel feels like a very episodic affair. Years sometime pass in the space of a chapter or an entire war is fought in a handful of pages. While the story flows nicely, it feels oddly lacking in depth at times, which makes me wonder what the original short story (which one assumes was a fraction of the 438 pages of the novel) must have read like. Yet despite those minor niggles, Joe Steele reads very well. Though there are occasional issues of credibility, Turtledove creates a compelling narrative that imagines what America might have been like had Stalin been born on in our country and was able to occupy the highest office in the land. It's a tale of what might have been and one that it suggests might happen still.